For over 30 years, I had suffered chronic knee pain. I read about Dr. Bradshaw’s knee pain treatments in a newspaper article. I desperately wanted to do anything except have knee surgery. I have to say that after just one treatment, the knee felt better than it had in years. The pain continued to decrease with Active Release Therapy and cold laser treatments. By my third week of treatment, I had no pain whatsoever! Before meeting Dr. Bradshaw, I could not get out of bed without limping to the shower. Now I literally jump out of bed. 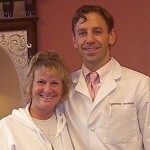 Dr. Bradshaw’s program is fantastic and I recommend it to all knee pain sufferers.